Joy Creek Photo Archive (c) all rights reserved A candelabra of flower spikes crown this upright perennial. Countless tiny long-protruding stamens give the densely packed spikes a feathery appearance. 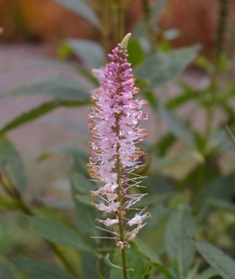 We have found Veronicastrum virginianum `Erica' to be a wonderful companion to Miscanthus sinensis 'Flamingo' where the pink flower color is echoed in the grass. Trimming back the spent spikes after the first flush of flowers will promote new growth and repeat flowering. But you can also leave the old spikes on and enjoy their form as they age. Midsummer to early autumn. 3-4 ft. x 18 in.